The US is releasing Mortgage Applications, Oil and Gasoline Stocks Change and 5-Year Note Auction. GBPUSD has been fluctuating within the rectangle for almost a week. 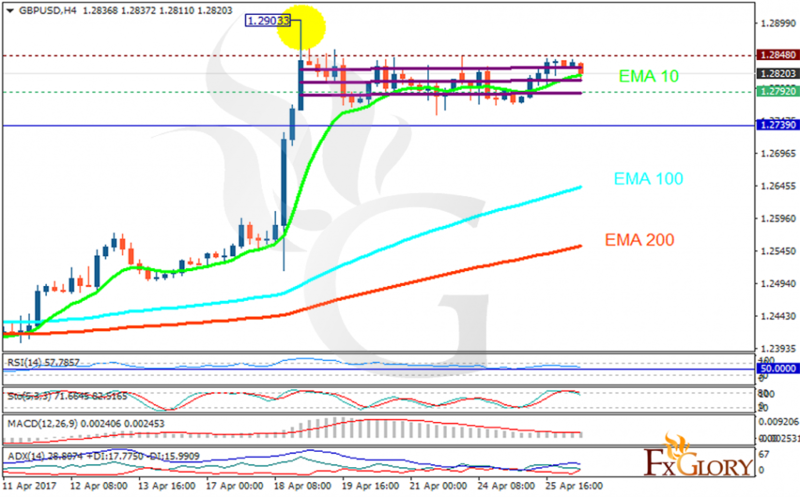 The support rests at 1.27920 with resistance at 1.28480 which both lines are above the weekly pivot point at 1.27390. The EMA of 10 is moving horizontally along the channel and it is above the EMA of 200 and the EMA of 100. The RSI is falling towards the 50 level, the Stochastic is showing downward momentum and MACD indicator is in positive territory. The ADX is not showing any clear signals. GBPUSD will continue its fluctuation; falling towards 1.279 area and rising towards 1.285.